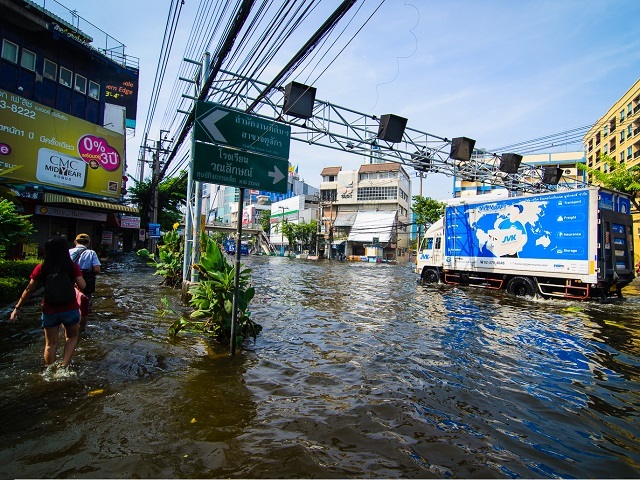 Situated in Thailand’s expansive Chao Phraya river basin, Bangkok is particularly susceptible to urban damage due to river flooding. Photo by Chrisgel Ryan Cruz/Flickr. Cities contribute 70 percent of the world’s energy-related greenhouse gas emissions and play an essential role in climate change mitigation. However, since average global temperatures are already rising and the effects of climate change are becoming increasingly palpable around the world, cities also need to focus on adaptation measures in order to strengthen their resiliency and better protect billions of global urbanites. With the changing global climate, river flooding in cities worldwide has emerged as an immense challenge to urban resilience. Currently, approximately 21 million people worldwide could be affected by river floods on average each year, and that number could increase to 54 million in 2030 due to climate change and widespread urban development. 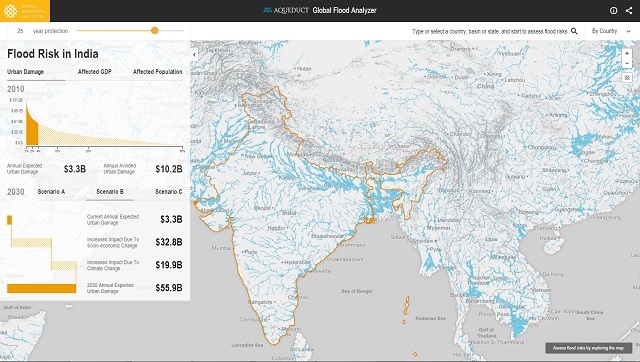 The Aqueduct Global Flood Analyzer, a new online tool developed by the World Resources Institute (WRI), quantifies and visualizes the reality of global flood risk. The Flood Analyzer allows users to estimate the urban damage caused by river flooding in various scenarios, and to gauge both the GDP at risk and the size of vulnerable populations. Given that cities are the primary drivers of economic growth and are home to over half the world’s population, it’s critical that city leaders are informed about the threats that river flooding poses to their citizens’ health, security, and economic well-being. The Flood Analyzer’s urban damage calculator allows users to estimate the direct damage in dollars that river flooding causes to urban areas. Users can toggle a selected country’s flood-protection level to determine not only how much damage would occur in the country’s urban areas, but also how much damage can be avoided as a result of flood-protection systems. A country’s flood-protection system is a broad category of both natural and hard infrastructure—from natural buffers like expanded flood-plain areas to strategic tools like dams, levees, and land use planning. Additionally, the Flood Analyzer can estimate urban damage in three different scenarios for 2030, depending on the magnitude of climate change and future development patterns. As the Flood Analyzer indicates, India currently avoids $10.2 billion in annual urban damage with 25 year flood protection level. Investing in flood protection infrastructure will reduce future costs and make Indian cities more resilient. Map by World Resources Institute. One key insight from the Flood Analyzer is the disproportionate impact of river flooding on countries with high urbanization rates. 15 countries—led by India, Bangladesh, and China—account for 80 percent of the aggregate population exposed to flooding worldwide. Furthermore, many of these countries are particularly vulnerable in terms of affected GDP and urban damage, given their intense concentration of unprotected people and buildings in cities. India, for example, currently has $14.3 billion exposed GDP, and that figure could increase tenfold to $154 billion in 2030 in just a “middle-of-the-road” scenario. In a country where 75 percent of national economic activity will soon be generated in cities, it’s imperative that leaders address their cities’ vulnerability to the urgent risk of river flooding. But India isn’t alone. Climate change is a global phenomenon, and regional river flooding often transcends city and national borders. Although the risks are escalating, there are plenty of opportunities for the public and private sectors to strengthen urban resilience and prevent catastrophic damage. The Flood Analyzer’s easily accessible data will help to raise awareness among decision makers and city leaders about the current and future risks of river flooding. Armed with this information, decision makers will be able to prioritize risk reduction and climate adaptation projects, and implement the most viable, cost-efficient options. It will take time and significant investment, but starting now, city leaders and decision-makers in international relief organizations, local governments, and the private sectors have an informative, powerful tool for developing vital flood protection systems and ensuring the long-term safety and stability of cities worldwide. Visit and interact with the Aqueduct Global Flood Risk Analyzer here. Should we inch or stride towards urban resilience?